Striving toward minimalism is finally letting go of everything, and looking forward in anticipation toward all that will be gained in choosing to live and embody a simpler lifestyle. And the choice to become a minimalist is as easy as declaring, “Today is the day!” Stating, “Enough is enough!” Realizing, “All of this stuff is weighing me down and dragging my health and happiness along with it.” Then you begin. First, by grabbing a trash bag and choosing to conquer one room at a time, or even just the junk drawer for now. Your life will never feel or look the same once you pledge to make the positive change once and for all. And that’s the beauty in simplified, minimalistic, conscious-living. No longer living this life of yours on auto-pilot, but discerning with purpose, and redefining success, wealth, happiness, and joy—on your own terms. Gifting—not just giving—yourself the permission to live the life you’ve always dreamed of, answering that call to be your authentic self, being counter-cultural in so many facets, and essentially, finding your own groove will be just a handful of positive outcomes of choosing to simplify your life while you strive toward minimalism. There is freedom in stating a firm “no” to the world, and shouting a resounding, “yes!” to your heart. You’ll wonder why you didn’t start sooner! I have learned there is joy in making sound, rightful choices that stem from a place of peacefulness. That you’ll breed contentment in making these calm, conscious choices without a senseless environment to distract you, or the mind-clutter and unfounded fear within you obstructing the view. Note, there is humility in taking less for yourself and sharing that excess with others. You will walk, talk, and feel lighter with each new step on this minimalism journey. Simplifying is a satisfying soul cleanser, to say the least. Take pride in how you define living a simpler life. Own what striving toward minimalism signifies to you in your own way. Don’t lose hope of what you’re starting. Work diligently, but gently and deliberately in all acts of simplifying and de-cluttering. Remind yourself that it’s all about balance—finding what works best for your life and heart. Choose now to live without all those things holding you back so that you can live the life you were meant to enjoy. Looking ahead toward a New Year, don’t despair if this year’s attempts to redefine your lifestyle look completely different from the steps you plan to make on the journey toward minimalism in 2017. That’s the beauty in the pursuit of simplicity. Go at your own pace and don’t rush the process. It’s all about being intentional, after all. You’ll find your purposeful groove, and one day you’ll realize you’re living a minimalist, simpler way without giving much thought to how you got there. Live your life simply, let go, follow your calling, forgive trespasses, and be set free. Regard yourself less and think of others more. Live your life in peace so that the light of love shines from within and reaches out to others. Make your path to minimalism your own, but not without sharing that steadfast joy with others, and being grateful for the chance you’ve been gifted to change for the better. Will you be striving toward minimalism in 2017? What small acts of simplifying and de-cluttering have yielded great, positive changes in your life? Think back on a time when you were most confident in yourself. Brave, steady, self-assured. Maybe it was the you of your youth. Maybe you were the top of your class. Stand-out football player. Star cheerleader. The lead in every school play. Maybe it was the day you landed your first real job, or jingled the keys to your own place. Maybe it was the day you boarded a plane to a faraway destination to trek in a foreign land. Maybe it was when you discovered you were actually quite good at creating poetry and others often told you how talented you were, and that you should publish a little book. 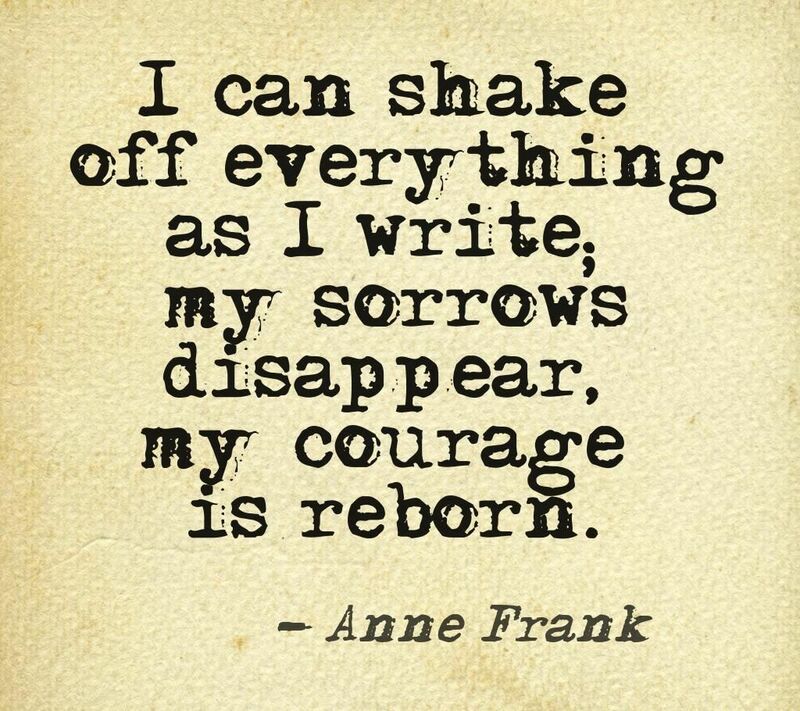 What would it take for you to allow yourself to feel that type of courage and vitality once again? To live and breathe for your true self? Do you miss some integral part of your identity from the past? Truly, have you ever felt happy and free? If yes, then take yourself back there. Relish in the delight of your childhood, your happy place, your favorite day. If you can honestly say that you’ve never had even one moment of pure happiness, nor felt free to be yourself, then today is the day to make that moment happen. No delay. Remind yourself, what were you like as a child? What was it that could hold your attention for hours on end? Maybe you were a romantic star-gazer. Maybe you sought solace by hiding away from the rest of your family, cuddled under the safety of a warm blanket, comforted by the company of characters in a borrowed library book that you literally couldn’t stop thinking about. Maybe you kicked the soccer ball against the side of your childhood home to relieve some teenage angst, but found your feet were sort of lost without the black and white ball between them to maneuver into a game-winning goal. Maybe your life would be miserable without the cool, wet rain on your face as you clocked another ten-mile run on a back country road. What would you do with your time if you had zero responsibilities to tackle today? What if you could gift yourself a day like that? One day of freedom to roam, play, and dream. How would you spend a day like that? Where would you go and what would you do? Go ahead, daydream a little. Now, seriously consider making this one day happen. All for you. It’s not selfish, it’s not. You deserve to feel this type of deeply held joy. What if you could arrange to do that one thing you once enjoyed, but have lost along the way? Would you dare dream such a moment can be yours once again? What’s holding you back? Please, don’t allow fears to be the culprit. I’d imagine your loved ones would be more than willing to help. It matters to become reacquainted with a piece of your heart and identity that you’ve buried away to responsiblity, embarrassment, or feeling like there is no time or place for it in your adult life. My guess is, if you only asked a loved one for their guidance, suggestions, and help in planning your one, special day, that they’d be flattered and quite pleased to lead the charge. Do yourself a favor: stop slighting you. Believe, instead. Conquer those fears, squelch that nay-saying voice, hush the negative opposition to your lifelong dreams, your hidden passions, your happiness, and rightful joy. What dream are you chasing? In the past, how have you made your dreams a reality? Do you ever feel that fear, anxiety, responsibilities, a negative inner-voice, or other’s expectations hold you back from going after your true passions in life? How would you spend the gift of one day devoted to pursuing your definition of pure joy? After I had completely weaned Baby Girl from breastfeeding, I was in desperate need of new clothes. Non-nursing clothes, to be exact! Even though I still had about eight pounds of pregnancy weight lingering on my frame, I was so ready to box up and donate what I had been wearing for almost two years and enjoy the freedom of dressing however I wanted. Clothing without restriction! What a dream! If I was lucky enough, toddler food stains would stay off of these enviable postpartum, post-nursing duds, too. Was it too much to ask to seek and find the mecca for all moms who just want to get the heck out of their sweatpants and wear something equally comfortable and affordable, but stylish and on-trend? For as long as I can remember, I’ve had a knack for finding steals and deals at shops like Marshall’s, TJ Maxx, and Clothes Mentor. Though, I could not find the energy to sift through the racks there and pull together stylish outfits for myself during that time. I wished for just one day to shop, to get all that I needed, and not have to think about it again. For once, I wanted someone else to listen to my style likes, wants, and needs and then actually find the clothes perfect for me in my size, favorite colors, budget, and do it all for me within a reasonable couple of hours while the kids were at school! Short of having a ladies’ maid and personal shopper at my disposal, I felt that I was an out-of-luck, tired mom in desperate need of help in the closet department. Apparently, not only was I seeking a personal stylist, but female-adult-level conversation, to boot! No wonder I was so willing to hand over the bundle of cash, and walk out feeling like a better version of myself. I walked around mall shops in a daze while seeking the answer to feeling better about myself in an entire closet make-over. After a whirlwind tour, I came home with multiple tissue paper-filled bags in each hand, having blown all of my budget in only one or two stores. And I felt… what? Nothing. That’s right, nothing different. Maybe even a little empty and disappointed in myself. Yes, I was exhilarated having just experienced the rush of a shopper’s high. Yes, I had some nice outfits that would encourage me to dress a little better and present myself well in the public eye. Though, I didn’t feel transformed in any way. And to be quite honest, that’s what I was hoping for, to be magically transformed by a mere trip to the mall. It took me far too long to understand the fault in my thoughts and ways. It would take the next four years for me to feel a true caterpillar-turned-butterfly moment had taken place inside of me. This magical transformation would have little to do with changing out the clothes hanging in my closet, and more to do with shedding the cloak I constantly hid behind that shielded my inner-truth and shadowed my self-worth. The woman I was years ago, that person whose desperate-to-dress-better profile was alarmingly self-important, is a vague memory. In reality, it has been only four years since I took the steps toward living my truth and simplifying all aspects of my life. I have researched and read about living simply, sharing wealth, minimizing lifestyle, simplifying and de-cluttering, and learning to live with intention and contentedness. Many like-minded people have begun, first, with their closets by ridding the clutter they face in the morning. They started by reducing what it takes to get dressed. I have followed suit. My first minimizing task was to take hold of my excess in clothing choices by keeping only the articles I enjoyed wearing and those I chose to wear time and again. Seems simple enough. My appreciation for lovely clothes hasn’t gone away, and I doubt it ever will, even with taking a streamlined approach to dressing myself. I’ve learned to have fun shopping my favorite discounters once more, though I visit only when the need arises, not the want stemming from boredom, anxiety, or self-doubt. I take delight in having a clean, relatively clutter-free closet representing my version of a capsule wardrobe , and intentionally cultivated with fabrics and colors that make me feel…well, simply me. Quite beautiful, in fact. If you are interested in minimizing your closet and clothing lot, are wondering more about capsule wardrobes, and would like to read other writers’ perspectives on how they maintain a simplified closet, I recommend reading Unfancy and Be More with Less. How do you manage the clothing clutter in your household? Do you have a capsule wardrobe for yourself or your children? What, if anything, would you change about your style? Before I go on about the ways I have simplified the task of feeding my family, I want to say that it has been a long road getting here and I’m not quite sure the path to eating perfection will ever be attained, nor should it. For many, many years, we ascribed to the “beans and rice, rice and beans” mentality until we learned that those meals, albeit healthy and frugal in their own right, were not kind nor helpful to the multiple health issues I am fighting against daily (Endometriosis, Adenomyosis, hormone imbalances, infertility, repeat miscarriages, migraines, and more). A few years ago, before I became pregnant with The Toddler, I was facing some serious stuff. That’s all I’m going to say about that except to note that my long-time doctor (sadly, now retired) and I had a major life-changing discussion in his office while going over my recent test results, ultrasound scans, and everything that could and couldn’t be done about the extent and seriousness of my illnesses (think: Cancer and gene testing). Scary stuff. As a last resort, this doctor—who was a champion for me and my health from my first appointment on, a beacon of hope in some of my darkest times of baby loss, one whom celebrated with us the birth of every child he surgically delivered, and the adoption of The Girl—urgently prescribed a type of modified-Paleo regime that strictly eliminated ALL grains and sugars from my diet for three months, and put me back on natural progesterone support. What I needed to commit to was a diet without rice or pasta (not even gluten-free), no pizza or breads, no fruits or desserts, nor sugar in my tea. You get the picture. He wanted me to check in every month and let him know how I was feeling, continue sending in my NFP charts, note any changes in all symptoms and frequency of migraines, any new or worsening conditions, anything positive or negative related to my cycle and health issues. After the three months’ trial, he said that I could begin to add one grain or sugar back into rotation at a time to see if and what I could tolerate in those food categories. I owed this special doctor so much for the family he helped us build, the prayers he prayed in our name, wholeheartedly trusting his medical knowledge and advice on the management of my health-related issues over the years, and appreciated his candid, yet gentle discussions with me about the truth and seriousness of the female disorders I live with every day. Although, in the past I had tried The Endo Diet, I was unsuccessful each time I tried to modify my diet to meet the requirements. It seemed overwhelming and daunting, especially during the times after another miscarriage or months on end of trying to conceive another pregnancy. However, three years ago, I was desperate. Hitting the vortex of desperation with my doctor’s newfound research, empathy and conviction to keeping another pending surgery at bay, he put me on the path to a whole new me. Truly. This major change to my diet, which seemed simple and doable against all the odds I was facing (after all, what did I have to lose?) in turn changed my health around almost instantaneously and, in a sense, gave me my life back. Quite possibly, considerably changing my diet is the one and only reason—aside from a true miracle—that The Toddler’s life exists. For this reason alone, I am humbled and feel blessed beyond compare, and try my best to maintain this type of eating regime for optimum health so that I can be the best version of myself for those I love the most. The one area of my life I refuse to scrimp on is what I serve my family to eat. In our household, we have multiple special-diets that we must adhere to due to a list of life-threatening food allergies and serious medical conditions. There was a time when I enjoyed cooking and learning new, elaborate recipes. Although I do still enjoy cooking and trying enticing recipes, health and safety is always on my mind. Over the last few years, I have discovered that simple, whole foods are the easiest, most cost-effective, and healthiest means to feeding my family. So, what are some of my strategies for feeding a large family with all the variables I mentioned above? How do I keep the necessary tasks of cooking and preparing healthy and safe meals, and shopping within a budget possible? For one, I make it a priority to serve raw and fresh fruits and veggies at most meals and for snacks. I tend to only steam, cook, or roast vegetables at dinner time. We do serve your typical “kid-friendly” snacks (Veggie Straws, Goldfish crackers, Annie’s bunny fruit snacks, etc…) but the list of packaged foods we choose to buy is slim due to allergen restrictions and my commitment to feeding my family more whole foods and less processed ones, and find it a relief to both my healthy-eating conscience and wallet staying away from most pre-packaged snacks for daily consumption. Over the weekend, I typically will buy the ingredients I need for cooking a pot of homemade chicken and vegetable soup, turkey and veggie chili, or Tuscan vegetable soup on Sunday or Monday for myself to eat at lunch and/or snack all week-long. This has been a lifesaver for my health-related and time-saving needs. It’s especially helpful to have this type of healthy leftover on hand for nights the kids have swimming lessons (pizza night! ), or when my husband is away on business and I serve the kids a meal they prefer (think: chicken nuggets, French fries, applesauce, and green beans!). What saves us the most time and money is eating a ton of left-overs, non-complicated foods, and simply, meal planning. An organic rotisserie chicken goes a long way and can be made into multiple meals throughout the week. The last of the chicken leftovers get thrown into the soup pot and all of the pieces combined make a delicious bone broth. Food waste is a big deal to me and one that I haven’t quite ratified 100% from my kitchen. However, I will tell you that by simplifying what is written down on my grocery list and not being too over-zealous in my meal planning, we waste much, much less than ever before. Managing to keep my food shopping to one or two grocery stores only—the two that best serve our eating and monetary needs–also helps. (In case you are wondering, I shop primarily at Aldi and Kroger.) Texting The Husband at the end of his work day when we are out of: whole milk, eggs, bananas, etc… and asking him to please stop on his way home helps me to stay out of the grocery store every few days, which also saves me from the temptation of over-buying and over-spending (but, it was on sale!) when we need only a few essentials to get us to the next pay period. We rarely eat out because it’s difficult to keep The Toddler in a high chair, not to mention the many allergies to consider. At this stage in our family’s life, we’d much rather spend our time and money elsewhere. Keeping to particular food shopping and meal preparation routines enables me to simplify my life to ensure there is adequate room for what matters most: keeping my family well-fed in healthy and safe ways, and making memories by spending our precious time together doing what we enjoy. Please share with me how you simplify the ways it takes to feed your family. Do you enjoy eating out together, or do you prefer to make homemade meals? What advice can you offer about simplifying meal-prep routines? If you ever came to my house for a visit, first of all, I would offer you a cup of Harney and Sons Tea with perhaps a homemade pumpkin muffin, and side of freshly cut fruit to complement. We would chat nicely for a time while you took in the surroundings of my home enveloped around us. After seeing for yourself how my family and I live, you might switch your friendly tune, abruptly stop our kind chat with teacup mid-sip, and proceed to yell at me, “FRAUD! LIAR! DECEPTIVE, you! Just who do you think you are? YOU, my friend, are NO MINIMALIST!” You might go so far as to almost slam the teacup down in protest, and storm out my front door in righteous anger. At once, I would apologize for inviting you over under false pretense, and plead with you to come back, stay for a just a little while longer so that I might explain myself with complete honesty. You might relent, but may come back to hear my explanations, though keep your arms crossed the whole time, and glare at me from across my beat-up kitchen table. To begin anew, I would smile at you in genuine likeness, then justify myself by telling about the beauty and calm I find in the art of simplifying. That I find intentional living a meditative process, and feel quite called to be sharing my family’s abundance with those in need. I might add that adhering to the practice of minimalism isn’t something that can be done in a day, a week, a month, nor even in one year’s time. Of course, I would tell you that I presently remain in the thick of becoming a minimalist, with a gentle reminder that my mantra all along has been “striving toward minimalism.” It would be worthwhile to add that my definition of minimalism may vary widely from others’ minimalist ways, and certainly may look completely unlike what you had in mind. From this point, I would encourage you to look around once more. I’d ask if you would you be so kind as to take into consideration all that I have just explained, with the meaning and purpose of my striving toward minimalism advising your thoughts and opinions? Perhaps, I would say, could you put on fresh eyes and glimpse again, though this time with a newfound understanding of my commitment to becoming so much more in the wake of a minimalist, intentional, and simplified undertaking ? Would you see it all rather differently this time? My continual journey of striving toward minimalism is fueled by my commitment to being intentional about my choices for what goes and stays, finding a harmonious balance of my family’s needs versus wants, and weighing out all of my decisions on a scale of joy, usefulness, and intent. Yes, I’m being deliberately slow in the process, but I’m inclined to keep a snail’s pace in order to be sure about what I am minimizing, and to pace myself for this lifelong pursuit. If you could choose one place (room, closet, cabinet, etc…) to de-clutter and minimize right now, where would that place be? What is overtaking your time, cramping your space, and hindering your peace? How might you immediately begin to simplify that area in your life? Embarking on this journey of self-imposed minimalism was not a path chosen on a whim, by accident, or for no good reason other than I was seeking something worthwhile to occupy my days. Rather, striving toward minimalism has been quite a lifelong internal pursuit of mine. Finally, I have reconciled my true desires—those of living more simply and intentionally by drastically reducing, de-cluttering, and minimizing all my worldly possessions—with the myriad of outward mistakes and demoralizing failures I chose to make by listening to the world’s voice—subtle, yet persistent—constantly calling out to me, “Consume! Spend! Add! Acquire!” Instead of heeding to my own truth, that inner-dialogue and guiding compass reaffirming that I was content and beyond rich with all that I had and have ever had, I gave in to the norm for far too long. Embarrassing as it is to admit my weaknesses—such as my propensity for over-consumption, my increased discontent even with all I owned and could buy, shopping too much and for pitiful reasons, and especially allowing my self-worth to be measured and determined by the type of things cluttering every shelf, closet, and corner of my home—I find it is worthwhile and important to expose my flaws here because it represents the pinnacle and point of realizing that I was stuck in old, demoralizing, woeful habits. And it is precisely where my journey to a better life begins. Changing oneself for the better is a terrifying, yet exhilarating experience. After all, someone once said, “If nothing ever changed, there’d be no butterflies.” I couldn’t agree more. What changes have you made that improved your life for the better? What has been your most compelling heart’s desire that you’re still afraid to pursue? I’ve been working on being content with what I have. Trying to fall in love again with my home. Trying to be happy with what I own, and being fine living without accumulating much more than what we already have. It’s a tough war going on inside of me. I see friends with bigger homes, houses cleaner than mine, their kids better dressed and well-mannered, enrolled in the greatest of sports opportunities, their lives seemingly soaring with perfection when my own seems a jumbled puzzle of trying times. I struggle with the balance of being fine with what has been given to me and what we work hard to maintain; what is being asked of me and what I feel I can manage with grace and balance, and it isn’t much. I’ll admit my tendency toward selfishness gets the best of me many days. In realizing this awful truth about myself, I try to combat the inner-greed by turning my attention toward the practice of giving thanks daily. Over the years, I’ve retrained my brain in a way to instill a sense of gratitude, not loss. At first, I thought my efforts fraudulent; now I know that’s farther from the truth. What contemplation of blessings brings is a perception of will and a renewed mind, body, and spirit. A peaceful place of heart and a contentedness of spirit grows with practice. Amazing what a simple, “thank you for my good health, thank you for the kids I finally have, thank you for the husband I can’t even believe is mine, thank you for the goodness all around me” can do for one’s overall emotional and physical health. What I’ve garnered from the practicing of minding grace is that my environment is affected by my natural discontented spirit. My home is a large source of contention, in this game, I’m afraid. Too often, I’m nervous when new friends are invited over for the first time, when family gather, even. My inner-critic feels fear of being judged for our ancient couch covered in a decade-old, faded Pottery Barn slipcover, the discount pillows strategically arranged to camouflage red marker and juice stains, all of the bargain Craigslist finds. Years ago, I used to be proud of my frugal nature, the knack I possessed for scoring the hidden gems at consignment shops and Goodwill. Deep down, I know I have nothing to be ashamed of, for this is who I really am—a delightfully frugal, sort of crunchy-kind of woman concerned with too much excess. Honestly, I’d be a nervous wreck having much nicer things than we own since my kids are still in that exploring stage, hard players, not too careful with a red marker in hand. They don’t care if our things don’t impress. So, I shouldn’t either. If I’m completely honest with myself and you, my patient readers, I’m not—at all—that unhappy with our place of residence. There have been countless wonderful memories made here, certainly some major heartbreak, but mostly the inner-workings of a family trying their best to live and love together inside the confines of a relatively small home. Most days, I like that we live among one another, that there aren’t too many places to hide away, that The Husband and I are teaching our children to be happy together. After all, what matters more than those we love? What is restless, truly, is my heart. And when this cracked, pumping vessel of mine becomes restive—as it is now—I realize that the unease is due to a level of great imbalance within our family, something is off-kilter inside the four walls of our home. An imbalance that I can’t seem to tip back to level. Discontented in spirit is a personal defect I struggle with each and every day. My initial reaction—when life becomes so overwhelming that it can’t be ignored—is that if I could just escape the confines of the instability here then the discontent will release its hold on my family and me, and we will be able to break free of the confines of the pain, the source of disruption, and all the troubles will disappear. In my right mind, I know that these issues we are grappling with will follow no matter the place and space, no matter what the numbers on the mailbox say, despite the size of the mortgage payments. Though, the fantasy of someplace fresher, cleaner, brighter, untarnished is a pleasant divergence from the reality of our messy lives. And so today, I remain stuck inside the walls and look for a resolve inside myself. For, we all know that the only control we have is over ourselves and our own choices. During quiet times of reflection and prayer, I can change my outlook on the muck before me and merely choose love, stillness and calm, patience, and tender care no matter the trial set before me. It’s my choice. And the choice is yours for the taking, too, if you are brave enough to change. The focus now needs to be keenly set on love. And not just the mushy-gushy type of heartfelt sentiments, but the difficult, tough-love kind—the talking myself into loving when my heart feels like a stone, when my stubborn nature builds walls around me, when I’m just plain tired of caring. When The Girl retaliates by ingesting foods with her allergens that she knows will make her sick, yet deliberately sneaks down to gorge herself on these intentionally, I need to find the love to deal with her terrible choices and the patience to remain calm when she is sick and wheezing all day long—she, yelling at me, as if I’m the one who made her so allergic and sick, as if it’s all my fault. These challenging times are the times to have compassion for her, to see the plight in her eyes from the slight stance where she stands before me, too often screaming in my face, her pain and anguish shooting daggers at my heart. Even in these trying times, I choose love. The focus now needs to be on remaining still—right where I am, exactly where I’ve been planted—because any slight movement might erase the magic in the moment—imperfections and all. For, when Baby Girl slides into bed beside me every night lately because of her fear of the dark despite a nightlight in every outlet, and the rising fear she feels of losing her almost-four-year-old self to the baby she once was not so long ago. Even when I feel the anger in losing precious sleep because of her beside me tossing and turning, snuggling up to every inch of me like she’s going to lose me in the intensity of her fears, I choose to be still beside her in her fear. Even in the middle of the night when I have been awaken too many times to worsen me for the wear—most definitely then—I must find the love for Baby Girl in the morning as she remains cuddled next to me, so innocent and happy, and kiss her sweet porcelain cheek despite my wretched grouchiness. I choose calmness and love, because who knows how long my Baby Girl will want to remain so close by my side? The focus now needs to be on patience and tender care—the kind that can mend hearts, minds, and moods—the type of uplifting calm and true presence of Love itself. So, when The Boy stays out late with his dad for a Cub Scout camp-out and at 11:00 PM comes home hyped-up on the thrill of Halloween excitement, animatedly describing the fun he had that night with his buddies, too jazzed-up to fall asleep, then suddenly, quickly resorting to full-on meltdown mode, startling his sisters awake—this is when a mindful patience is necessary. Certainly, when The Boy wakes up at his usual early bird time, clocking only eight hours of sleep last night, uncharacteristically grumpy during breakfast, head-strong and groggily resolved to build Legos this morning, speaking only in whiny retorts to his sisters who are annoying him a little too quickly today because of his sleep-induced edginess—this is when I still remain patient in loving him in the rough moments together and all throughout this jolted day. For my son, I choose love because he needs to know that he is deserving of my love despite his having a bad day, and that I will always love him no matter what. Folks, my dad said it best when he turned to me, just before he walked me down the aisle to be married to The Husband, with tender concern in his eyes and stated, “Remember, LOVE IS A CHOICE.” My late father’s words have remained within me, and make more sense now than ever before. Going forward, my focus remains inward with the intent of turning all the interior reflection outward realizing the swirl of imperfection in my family’s less-than-ideal traits are so delicately mirrored as my own personal deficiencies, though it can all be overcome in time by choosing love. Humble mom moment. It’s that time of year, one resplendent with making promises to ourselves that this new year will be better than the last. It’s an awesome, positive time of year despite that the good intentions might be laced with bitter despair by looking back on all that went wrong in a previous year. In 2013, I was facing emotional and physical trials that put an abrupt end to any worthy resolution I had in mind for the year as I began with joyful anticipation of focusing on growing my family and writing my motherhood stories. Instead, I spent my days and months fighting to get my body, mind, and spirit back. It was an exhausting feat, but I survived and once again, the wounds of despair have made me a stronger, kinder, more resilient being. The writing, in fact, saved me. The first week of 2014 has found me locked up indoors tending to my three children, all whom fell ill in a staggered progression that began with a quick onset of fever and chills, moved to various stomach ails, and was followed by a brutal, lingering head and chest cold. Now we are all stuck inside a little while longer due to the unsightly arctic blast growling outside. No school, no recreational activities, no heading out for us. There are blessings in being grounded together for a couple more days. Not only do the kids have some extra time to recoup, but I’ve found ample time to reflect on what I want differently out of today, tomorrow, and the days ahead. At the top of my priorities for this new year? Cutting myself some slack and worrying less about the future. Living less in my mind and more in the present. Lacerating my tendency toward undue anxiety and negative self-talk. Deeper, mindful breathing. Allowing myself to move slowly and deliberately as long as I’m heading forward and onward to a better self, life, and sense of purpose. Slow down and live life more fully. What do you have in mind for your new year? How do you want to live differently just for today?